At Arizona Smile Designers, we are proud to provide a wide variety of dental care to patients of all ages in the Cottonwood area. We work hard to create a friendly and welcoming office environment so that every one of our patients feels comfortable when they walk through the door. Our team of highly trained doctors is able to care for almost any dental issue in the comfort of our office. Our treatment options include general dentistry and check-ups, cosmetic solutions and even oral surgery. To learn more about root canals, continue reading. A root canal or endodontics (“endo” – inside, “dont” – tooth) is a dental procedure that removes infection or inflammation in the pulp of the tooth. 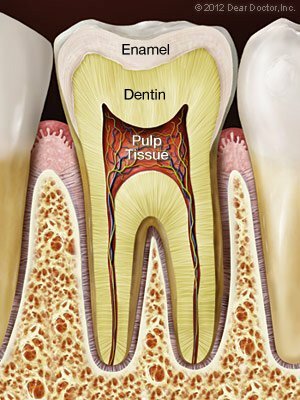 If left untreated, infected pulp can lead to dental abscesses and other health problems. 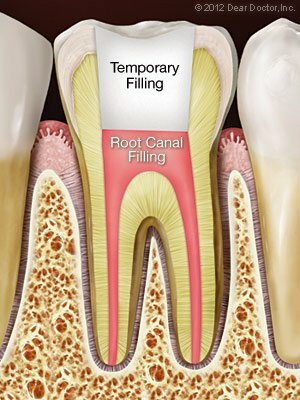 While most people think of root canals as being painful, it is usually no more uncomfortable than getting a filling. While a root canal may seem painful, it will effectively cure acute infection and tooth pain, leading to a happier, healthier smile. A root canal and restoration can also help you avoid the issues that can crop up when a tooth must be removed, including shifts in tooth placement, the need for bridges or dental implants and the loss of bone structure around the area of the missing tooth. Root canals are used to treat infection and inflammation in the tooth’s pulp tissue. 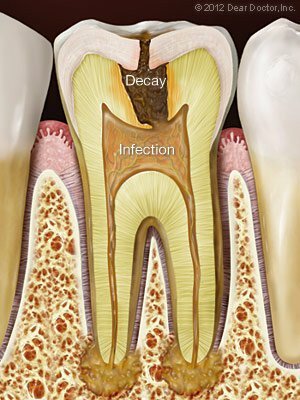 Common causes of infection and inflammation include deep tooth decay from untreated cavities and bacteria from chipped or cracked teeth. Any opening in the protective enamel of the tooth can allow bacteria to infect the tooth. Another cause for root canals is trauma to the tooth, which can result from a sports injury, a fall or a car accident. In these cases it’s necessary to seek treatment immediately in order to save the tooth and prevent any further issues. Sometimes extensive dental work can also cause damage to the tooth pulp and require a root canal. Having multiple fillings or restoration work on the same tooth increases this chance of infection. In rare instances, common procedures like crown preparation or orthodontic treatment can lead to pulp infection as well. A root canal begins with the administering of an anesthetic to numb the tooth and the surrounding area. For most patients, this is the most painful and uncomfortable part. Next a small opening is made in the surface of the infected tooth so that the dentist can reach the pulp chamber and root canals. Then the dentist will use small instruments to remove the infected pulp. Then the tooth and empty canals are cleaned, disinfected and filled with biocompatible material. Finally, adhesive cement is used to close to the opening of the tooth. Your tooth will feel some sensitivity or tenderness in the days after your root canal. Over-the-counter pain relievers can help relieve discomfort, but prescription medication may be given if needed. You should avoid biting on the affected tooth for a few days as well. In order to protect the tooth and restore it to it’s full function, you will need to have a crown or restoration put on. Restorations can take many forms, including gold crowns or a tooth replica. If you feel constant and severe pain or pressure in your mouth or notice swelling and extreme sensitivity in your gums, call our office to schedule an appointment – there is a good chance you’ll need a root canal. Other symptoms include sharp pain when you bite into food and lingering pain after eating hot or cold foods. If you believe you are in need of root canal and would like to schedule an appointment, please don’t hesitate to contact our Cottonwood office. Our friendly staff is always happy to help! If you have additional questions about root canals, check out some of the articles below or call our office. We look forward to hearing from you!